Hi, Guys did you accidentally deleted your chats history of WhatsApp on Windows Mobile Phones? Can, you recover chat messages back? Answer of this query is “Yes”, we can recovery of deleted WhatsApp chat history on windows phones. If you lost all chat history from your windows phone, then you can easily get back if you have backup copy of chat history in your phone. Actually chat messages are not stored on the WhatsApp servers, they are only stored in your internal phone memory. WhatsApp creates a backup copy of your all chatting history on your internal phone memory, and you can restore messages easily from this copy. First, you have to check exact time on which you create last backup file. During the backup, all chat history will be stored in it. You will be lost all of the messages that you have sent and received during the backup was created. In chat screen window, tap on the three dots in the bottom right hand corner >>> Click Tap Settings option >>> you can see the last backup time under backup. Note: Please, do not tap backup, otherwise a new backup fill will be created.With in week you can easily recover your lost data on WhatsApp, simply uninstall WhatsApp and then re-install WhatsApp from your windows mobile phone. Tap on the Windows Home icon and swipe the screen to the left. Scroll down to WhatsApp, press and hold for few second on the icon, then select uninstall option. Install WhatsApp on your windows mobile phone. When you reinstall WhatsApp, WhatsApp asked to you, do you want to restore message history. Choose RESTORE option to recover lost data. 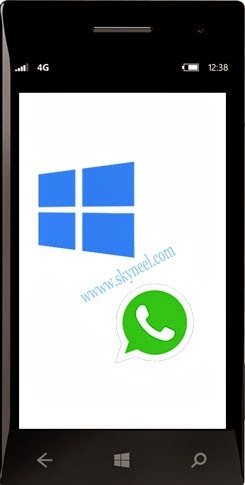 I hope you like this recovery of deleted WhatsApp chat on Windows Mobile guide from which you will be able to easily recovery of deleted WhatsApp chat on Windows Mobile without any extra efforts. If feel any problem in this guide then please use comment box. Thanks to all. actually i have not backed up my whatsapp chats and i uninstall whatsapp.can i recover my previous chats.? i badly needed that chats. there is any option to recover tht..? however now i want to reinstall and use and want to restore all the chats is it possible? yes, if you save your whatsapp databases folder. hi , I want get back whatsapp msgs a year back is that possible from windows phone ?